This Product Order Supplies the Following BOM (Less Foundation and Installation) in accordance for Use as a 170 Foot ROHN 45G Tower with EPA's (Effective Projected Area) Ratings for 110 MPH (REV. G). Refer to Larger Image for EPA Information. This 45G Tower is to be used in a Guyed Configuration according to Specifications in the ROHN Catalog. As a Guyed Structure, a 110 MPH rated Tower can rise to a maximum of 240 feet. 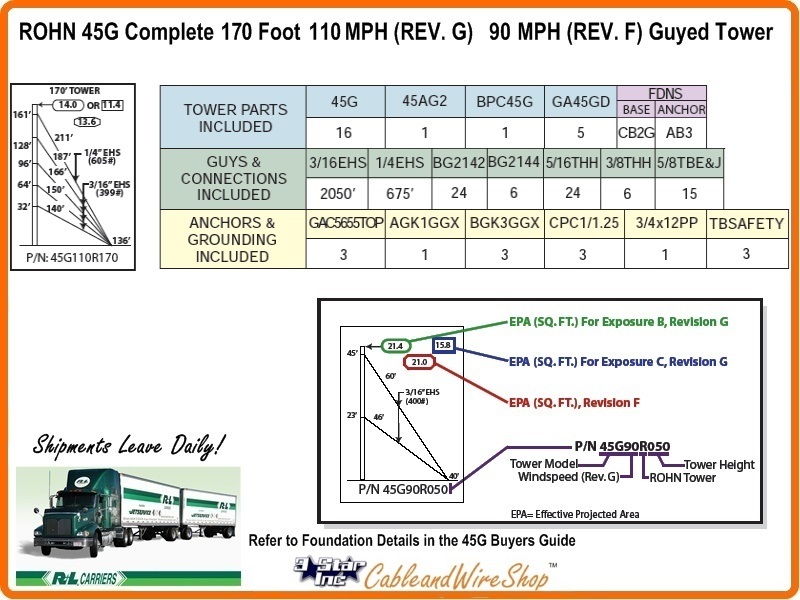 Consult ROHN Catalog Links at Footer Section at Bottom of Page for more ROHN 45G Tower Details. Tower and foundation installations should be performed by qualified and experienced personnel using construction drawings. This document is to serve as a guide for sizing and buying the 45G tower. All types of antenna installations should be thoroughly inspected by qualified personnel and re-marked with appropriate danger and anti-climb labels at least twice a year to ensure safety and proper performance. Wind Loading, Antenna Loading and Wind Survivability ratings vs. Height Documentation Provided by ROHN is available here as a Resource, but is by no means complete by itself or a susbstitution for Engineering Conducted Specific to your Application. Contact Us with any Questions you may have regarding Use prior to Purchase. All Information regarding the ROHN 45G Tower line, Parts and Accessories is as accurate and complete as we can possibly provide given that this Resource Offering is subject to change without Notice and is beyond Our Control. 3. Designs assume two 1/2" diameter lines on each tower face. This Buyers Guide will answer many questions you may have on this Product Line. For more detailed information and Specification Sheets covering many aspects of Various Parts, Accessories and Installation Scenarios... Please refer to the "ROHN 45G Tower" Link appearing in the Footer of this Page Below!